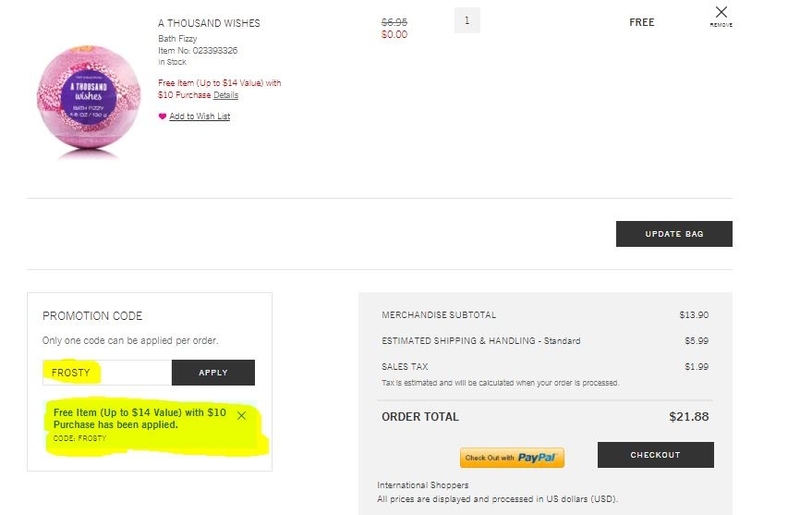 Olivia Fross This deal works just fine. The only issue is it doesn't count on the super discounted stuff. It wouldn't let me use it on the $12.50 candles. 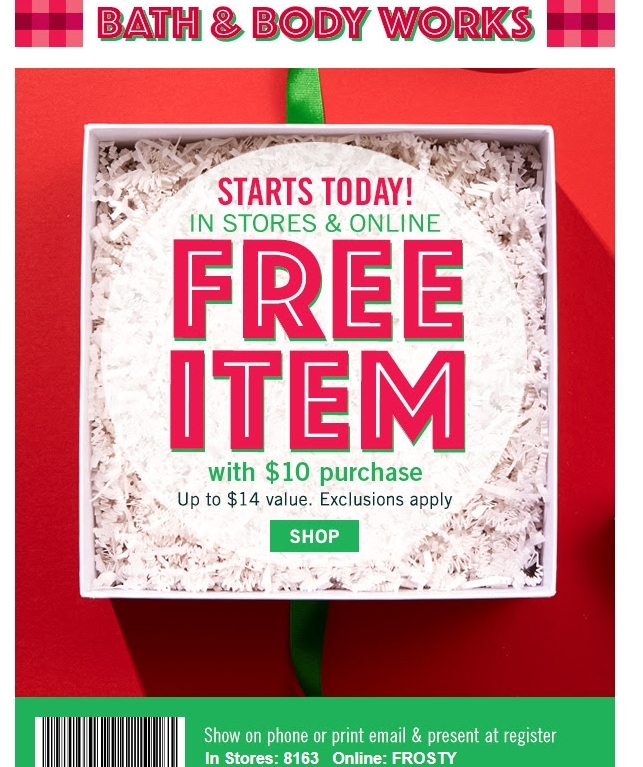 The free item is at retail value up to $14. elvira ramirez This deal was tested and works as described. Select your products, and enter the promo code at checkout to get the discount. Alanda J. You must buy 3 to get one free with the promo code. Anthony Castro Free Item (Up to $14 retail value) with Any Purchase of $10 or More through November 22, 2017. Offer excludes 3-Wick Candles and Signature Fine Fragrance Mist Sleeves. Stores: Print this email or provide on mobile phone at a U.S. Bath & Body Works store at time of purchase. Online: To redeem online, add the qualifying amount of merchandise shown above to your shopping bag, enter promotion code FROSTY during checkout, and prices will be adjusted. Shipping and handling will apply to the free item. Both: Sales tax, shipping & handling, gift cards, gift wrap and previous purchases do not qualify toward minimum purchase amount. Limit one offer per customer. 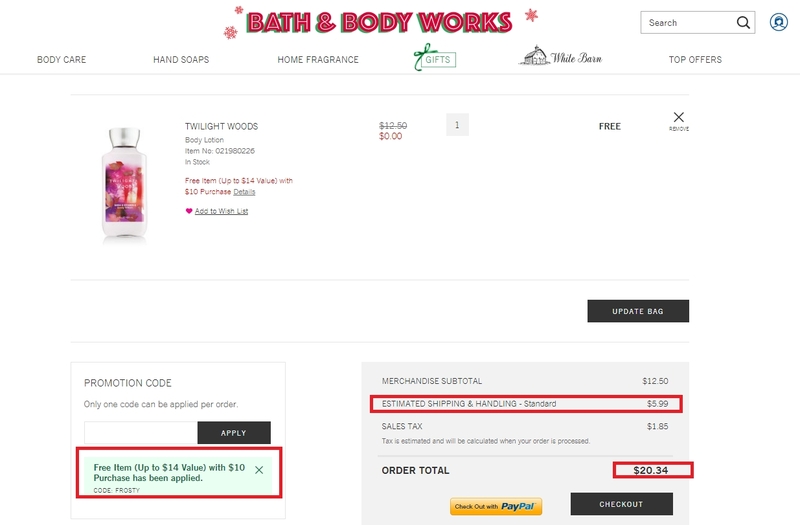 Cannot be combined with another coupon or code-based promotion. This offer is not redeemable for cash or gift cards, nor is it valid toward previous purchases. Return of discounted item(s) will be for the price actually paid and the value of this offer will be forfeited. Offer valid for dates shown above. No rain checks issued. Void if altered, copied, transferred, auctioned or sold. Selection may vary by store and online.